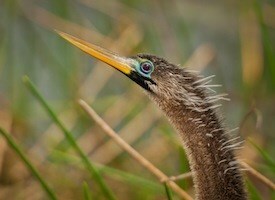 Did you know that the islands of Lakes Park are home to a great number of birds in Lee County? In fact, it is one of the most important nesting rookeries in the country. In nesting seasons, over one-thousand (1,000) nests are in the rookery. In the fall, Lakes Park is a great place to see migrating birds. The rookery is monitored year-round by the Lee County Bird Patrol. These volunteers count the birds and their young, then report their findings via eBird.org, a joint project powered by the Cornell Lab of Ornithology at Cornell University and the National Audubon Society. The Lee County Bird Patrol offers tours of the rookery and bird viewing walks in the park. Check out the tour schedule at www.BirdPatrol.org. A dark wading bird with a long, down-curved bill. 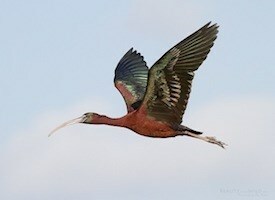 Although the Glossy Ibis in North America lives primarily along the Atlantic Coast, it also can be found in Europe, Africa, Asia, and Australia. 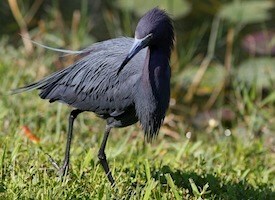 A small, dark heron arrayed in moody blues and purples, the Little Blue Heron is a common but inconspicuous resident of marshes and estuaries in the Southeast. 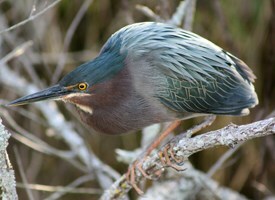 From a distance, the Green Heron is a dark, stocky bird hunched on slender yellow legs at the water’s edge, often hidden behind a tangle of leaves. 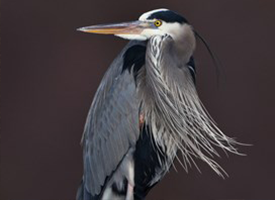 This stately heron with its subtle blue-gray plumage often stands motionless as it scans for prey or wades belly deep with long, deliberate steps. Anhinga is known as the Water-Turkey for its swimming habits and broad tail, and also as the Snake-Bird for its habit of swimming with just its long head and neck sticking out of the water. 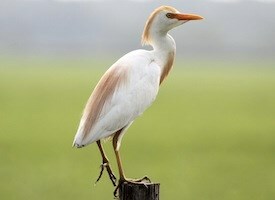 The Cattle Egret spends most of its time in fields rather than streams. It forages at the feet of grazing cattle, head bobbing with each step, or rides on their backs to pick at ticks. 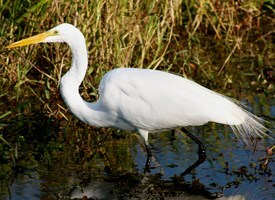 The elegant Great Egret is a dazzling sight in many a North American wetland. Slightly smaller and more svelte than a Great Blue Heron, these are still large birds with impressive wingspans. They’re most active at night or at dusk, when you may see their ghostly forms flapping out from daytime roosts to forage in wetlands. 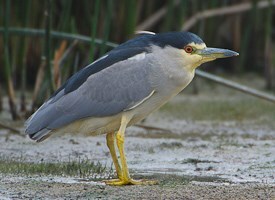 Stocky birds compared to many of their long-limbed heron relatives.